Whether you discover Vintage Oaks during a tour of the Texas Wine Trail or seek us out because you are already aware of its spectacular beauty and superior lifestyle offerings, one thing is certain: you will never be the same once you have experienced Vintage Oaks. Contact us today to plan your visit.  If you are already local to the area, you know how easy it is to get to Vintage Oaks from Austin, San Antonio, and everywhere in between. If you are visiting from out of town, let us help you plan a day in the Hill Country—starting at Vintage Oaks! Visit our Sales Center at 1110 Vintage Way, New Braunfels, Texas, 78132. Experience the stunning natural environment of Vintage Oaks, including towering trees and winding roads, while you investigate why it is Comal County’s fastest-selling community. Walk the land and discover just how spacious, well-located, and alluring the Vintage Oaks homesites are. Arrive at the Amenities Center, and soak in the Tuscan-style charm and grandeur of the exceptional pool, lazy river, outdoor kitchen, and gracious meeting areas. And, when you’re done, meander just across the road to visit the Dry Comal Creek Winery. It is sure to be an experience you won’t soon forget! Call 830-885-3054 to speak to one of our sales representatives today! Visit our Sales Center at 1110 Vintage Way, New Braunfels, Texas, 78132. As locations go, it just doesn’t get any better than Vintage Oaks. From the allure of the Texas Hill Country, with its impossible panoramas of oak-studded rolling hills, to the many enticements of New Braunfels and surrounding cities, Vintage Oaks puts a world of opportunity at residents’ fingertips, and as much—or as little—activity as you would like. Vintage Oaks is uniquely convenient to a whole host of amenities including the famous Schlitterbahn Water Park, sailing on Canyon Lake, numerous area golf courses, the unique charm of historical Gruene, and the Tanger Outlet Center in San Marcos—the third-largest tourist destination in Texas and noted as one of the top shopping stops in the country. Even closer to home is the Dry Comal Creek Vineyard, located just adjacent to Vintage Oaks. Just thirty miles away, you can enjoy a stroll down San Antonio’s famous Riverwalk, with its rows of unique shops and restaurants, including some of the best Mexican food in the world. For nightlife, Austin’s music scene is unmatched. The famous Sixth Street comes to life every weekend with live entertainment, while afternoons can be spent tubing down the Guadalupe River.